We had the pleasure of experiencing three very unique hotels in Maui during our stay on Hawaii's best island. It is loved so much by visitors, that the readers of of Conde Nast Traveler have voted is so for the past 17 years! If you are stay on the island for a week or more you can easily check out a few different areas and resorts and we highly recommend that you do. From the chilled out surfer vibe of the Paia Inn in Paia, to the traditional Hawaiian family run feel of Napili Kai to the full on beach resort of Mekena Beach Resort, there is something different for everyone. Located on the North Shore in the sleepy surfer town of Paia, this boutique hotel is a breath of fresh air. It's a place where you run into the likes of Luke Wilson eating some fish at the Paia Fish Market along side locals, tourists and surfer dudes. The guys will love the Paia Inn as it was voted The World's Sexiest Staff by Travel and Leisure, but I think that they could easily be included in the World's friendliest staff as well. It is surprising how modern the Paia Inn is inside. From the outside it looks like a charming little B&B from a bygone era, but enter the grounds and you experience a hip urban feel. Our two-room suite was cozy and inviting with fluffy duvets and two (count them) two flat screen TV's. The separate sitting room was a bonus to be able to sip coffee, while watching the morning news. 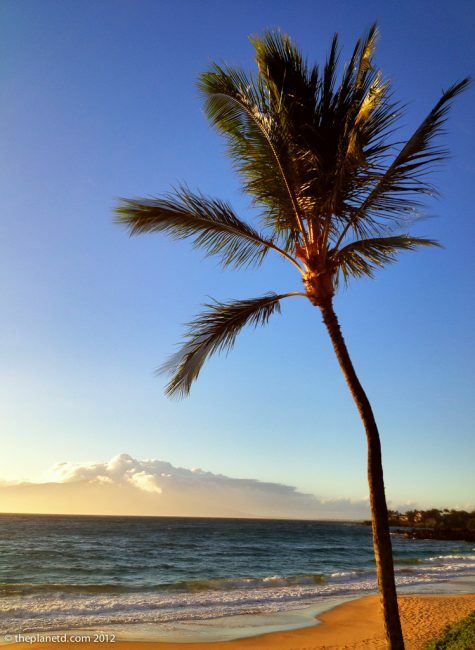 Paia Town may not be directly on the beach, but the property of the Paia Inn is. The grounds stretch back to a gorgeous long beach where all customers have access. There's a tranquil enclosed lawn where you can bask in sun while sipping fresh lemon or cucumber infused water on plush lounge chairs, enjoy one of their yoga classes overlooking the ocean, or you can go out it's secure door to lay on the beach for the day. It's up to you. 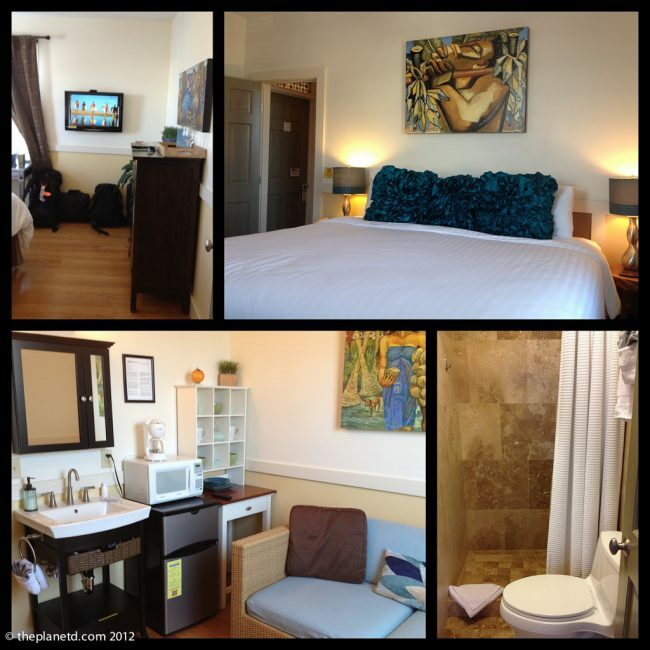 Paia Inn was definitely more in tune with our style of travel than other hotels in Maui. We love a small establishment where one can chill out in the common areas, read a book and let all the stress of life melt away in a tranquil environment. Of all the hotels in Maui, this was the place we spent the least amount of time and I wish it was the opposite. Located on Napili Bay's sandy shore, it’s got an old school Hawaiian charm. Only two stories high and a staff that is like family, you'll feel at home as you relax by the pool or enjoy your condo style room. Put your feet up, open the door and listen to the waves splash against the shore. Enjoy a torchlight dinner at the Sea House Restaurant or make your own in your modern kitchen and enjoy on your balcony while you watch the spectacular Hawaiian Sunset. At night listen to an authentic Slack Key performance by Grammy Award winning artists or take a sunset walk on the horseshoe bay. There's plenty of activities to do as well. From surfing and paddle boarding to snorkelling and swimming, Napili Bay is as smooth as glass with just enough of a break to the far left to be able to catch a wave. 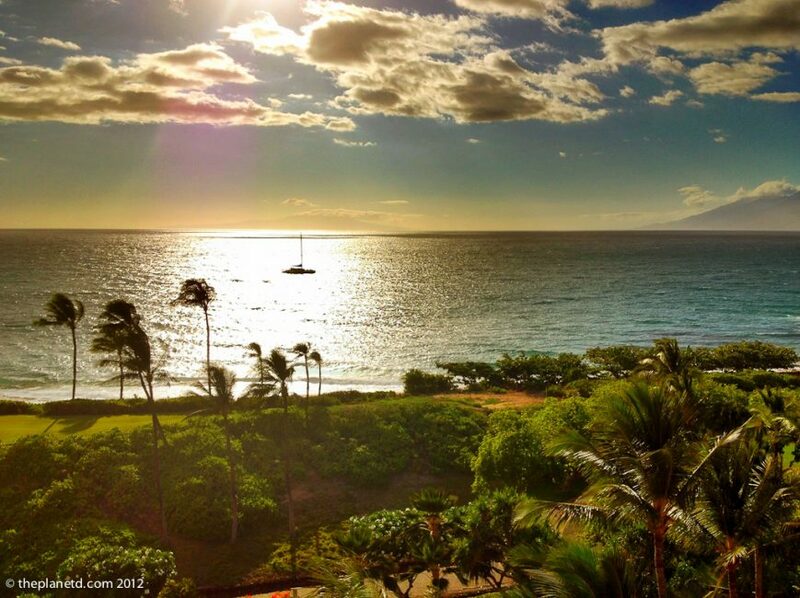 It is one of the best swimming and snorkelling beaches in Maui and we can attest to that. We actually looked forward to falling in the water while taking our paddle boarding course at the resort. There's plenty to do between their four swimming pools and gymnasium and they even have an 18 hole putting green! But it's the little things that make a difference and the Napili Kai Beach resort offers free in room wireless Internet access, free laundry detergent at the laundry, fresh morning coffee, afternoon tea and free parking. 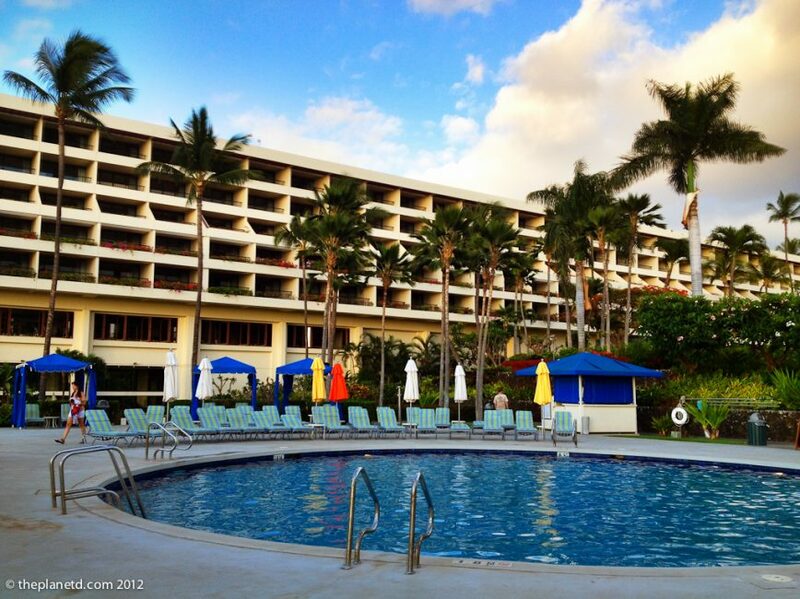 A great family resort, you will feel welcome and at home during your stay at Napili Kai. 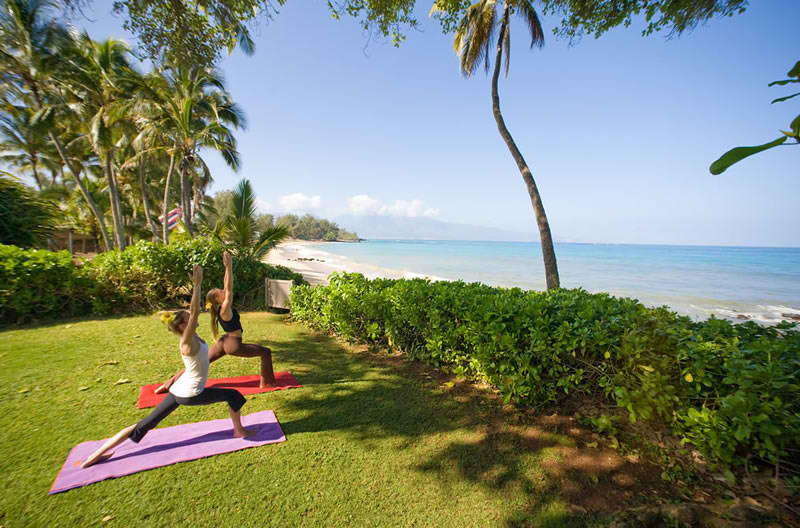 For more on Napili Kai Beach Resort, visit their website for rates and location. The minute you step into the open air lobby overlooking the gardens, waterfall and koi ponds of the Makena Beach Resort, you know that you have reached a place that will instantly transport you to paradise. Located on the south end of the island at the foot of Mt. Haleakala, there is plenty of adventure travel to be had as well. From body boarding to snorkelling and hiking to paddling your own outrigger canoe one can spend days basking in the sun of “Maui's best kept secret.” Their outdoor activity staff is friendly and ready to help you with whichever adventure you desire today and you can even spend a day on the greens. The rooms have all been recently upgraded and we felt at home in our boutique style suite overlooking the sea complete with flat screen TV,complimentary Internet, free valet parking and refrigerator to store our snacks and drinks bought at the local store. We don't normally write about food, but their Japanese seafood buffet was the best we have ever had, so it is worth it to dine at the resort on a Saturday night while witnessing Maui's spectacular sun sets over the island of Lanai. 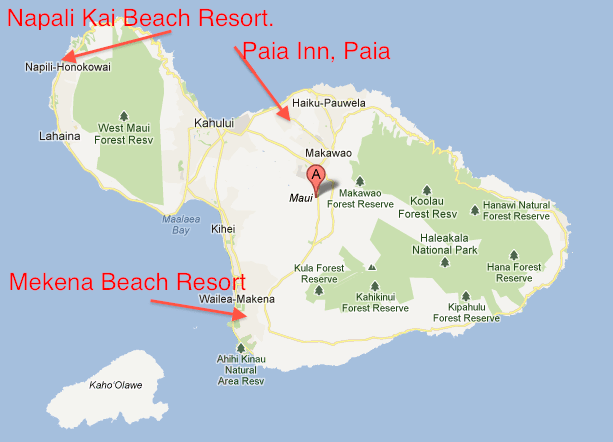 Makena Beach Resort is a full fledged resort. If you are looking for a place with all the amenities you need to be able to stay put for your vacation, this is the place for you. Tucked away at the south of the island and surrounded by golf courses, this is a place for people who need a vacation. All the activities you need are on the beach, there are quiet pockets around the resort to relax with a magazine and with several restaurants, a coffee shop, walking paths and it's own private beach and golf course, you don't have to leave Mekena at all during your entire stay on the island. 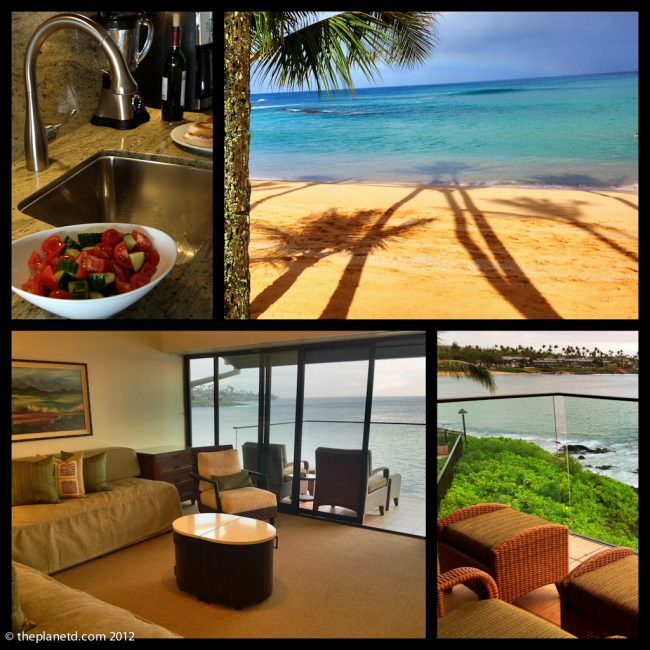 To find out more about Makana Beach Resort, visit their website for details. Maui has something for everyone. It's an island filled with adventure. By staying at three different hotels in three different locations, we had the chance to experience and do very different activities on the island. We went Kiteboarding near Paia, went Paddle Boarding at Napili Kai and Enjoyed our very own outrigger canoe and snorkelling experience experience at Makena. With a perfect blend of adventure travel, the fine cuisine and entertainment, a proud and strong culture and scenery to die for, a person could get lost in the Hawaiian hospitality of Maui forever. Ah Maui, we'll be back my friend. 14 Responses to "Three Unique Hotels in Maui"
The standard of hotels in Maui is very good overall and these three options look really good. I wouldn’t mind staying in them all. Have been planning a holiday in Hawaii now for some time but something always gets in the way. I got a great offer from Tour America today, might actually get there next year. Awesome, I hope you make it there Tom. Can’t wait to hear about it when you do. congratulations you just made me want to drop everything and go on a vacation. I’m going to be daydreaming the rest of the day wanting to be in maui. What gorgeous photos! That beach side yoga looks incredibly relaxing. Did you find most hotels had some type of yoga offer attached to them? or did you have to find a separate studio? What was pricing like? Most of my friends who live in Hawaii constantly talk about the outrageous living expenses there. Have a great time Seattle, you are going to love Maui. Brilliant! Just looks like a spectacular place to unwind. Thanks Hogga. Yep, I could unwind in Hawaii forever:) Especially Maui.